Short shorts on men: Dismantling sexist double standards one 5-inch hemline at a time. Al Gore and Bill Clinton, doing what they can for the cause. If short shorts on men are dangerous, then I welcome a state of emergency. The shorter short can, of course, make for a compelling visual—think Daniel Craig emerging, boy-shorted, from the sea in Casino Royale—but short shorts on men also confer social benefits to everyone. In a world where women’s bodies are often dismissed as “dangerous” and “wrong” when exposed, girls are made to pass fingertip hemline tests to gain access to middle-school classrooms, and authority figures claim that these rules and regulations are put in place to protect girls from boys, pulling the short short onto the other leg implicitly dismantles these sexist structures. Craig’s ocean scene wasn’t just a proud moment for short-shorted men everywhere—it helped to restore the cosmic balance between cheesecake and beefcake in the Bond universe. And a man needn’t reach Hollywood levels of fitness to contribute to the effort. To the contrary! All body types are welcome in this Campaign for Short-Shorted Men. 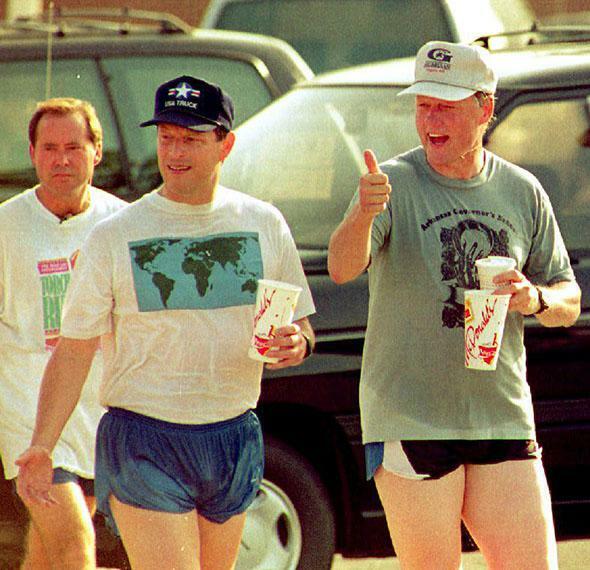 The Huffington Post may have called resurfaced photographs of Bill Clinton and Al Gore hitting the 1992 campaign trail in itsy bitsy running shorts “embarrassing,” but in my view, discriminating against the body of the short wearer would be antithetical to the very spirit of the hemline lift. So bring on the Luke Dukes. But hold off on accepting the news that socks with sandals are suddenly fashionable—that story is totally bogus. * Correction, June 5, 2014: This post originally misspelled the last name of Wall Street Journal reporter David Colman.